Thanks to everyone for generously supporting the Haven Playground Fund! This past holiday season, Lim Geomatics offered to match all donations up to $10,000 until December 31, 2018. We are pleased to report that we exceeded the $10,000 mark before New Year's Eve! MHI is looking forward to announcing the start of the play area's construction this Spring/Summer. In the meantime, MHI will continue to accept donations online for the Haven Playground. A heartfelt thank you goes out to all our donors, especially Lim Geomatics, which stepped forward for the second consecutive holiday season with a $10,000 pledge to support our dollar-for-dollar matching campaign. On behalf of the children at the Haven and their friends, thank you for giving the gift of play. There is nothing better than the sound of children laughing and playing. The simple pleasures a well-designed playground can offer can have long-lasting impacts, with benefits that extend from childhood through to adulthood: improved physical and mental health, educational opportunities, community connections and environmental awareness. The playground at the Haven will offer a place where stimulation, socialization, excitement, joy and wonder can take place. Children can develop mobility, strength, balance and coordination while moving from active, to imaginative, to passive play zones. The environment will blend seamlessly with its surroundings and offer a space where children and adults can gather and spend an active or quiet afternoon. 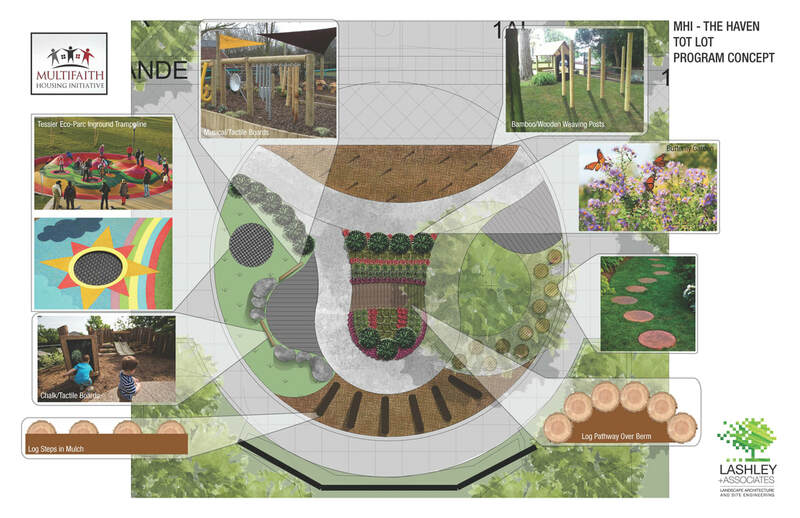 The playground will also offer children the opportunity to interact with nature by incorporating a butterfly garden. Nooks, berms, seating and shaded spaces will provide children a place to retreat from busy play while balancing logs and climbers will encourage children to work together to build or chase each other in a game of tag. The impact of the financial support we receive is crucial in our mission to provide and promote affordable housing to people at risk of homelessness. With every dollar you donate to MHI, you are investing in providing safe and affordable housing in Ottawa. MHI relies heavily on the generosity of individuals, faith communities, foundations, and corporations to help fund the provision of affordable housing here in Ottawa. Just think of what we could change if everyone made an investment like you? Your impact is bigger than you think. It’s not just a number, and it’s not just for right now. It’s an investment for the future. That’s what MHI is all about. Donate online by clicking on the button below. A tax receipt will be issued by CanadaHelps. It's easy and a very cost-effective way of supporting MHI. Contact us and we can set up you regular monthly donations via pre-authorized chequing or through Electronic Funds Transfer (EFT). For monthly credit card donations, please click here and you will be redirected to Canada Helps and you will be set up on their secure site. Monthly donations give you the flexibility to increase, decrease or pause your gift at any time. A cumulative tax receipt will be issued annually. Donating public securities and mutual funds is the most tax-smart way to make donations in Canada. Eliminating the capital gains tax, you can give more and receive a larger tax receipt. The Canada Revenue Agency (CRA) does not apply capital gains tax on donations of publicly traded securities. Capital gains are the increase in the value of your securities over the price you paid at purchase. When you sell your shares for cash, you're responsible for the tax due on the gain, even if you plan to donate the proceeds from the sale. If you pay the tax out of those proceeds, there's less money left to donate. It's a smaller donation and you have less to claim for your charitable tax credit at the end of the year. But when you donate your securities, those capital gains aren't subject to tax. This means you are giving a larger donation and you will benefit from a tax receipt for the full value of your eligible securities or mutual funds. Let's say you purchased common shares in ABC Company for a cost of $10,000. If the current market value of those shares has increased to $50,000, you would have a capital gain of $40,000. If you sell those share and donate the cash proceeds, you'll owe tax on the capital gain. So, you set aside the taxes due from the proceeds, leaving you with less than the full cash value to donate and a tax receipt which reflects the smaller donation. But when you donate the shares directly, you owe no capital gains tax and you're able to donate the full value, which makes your donation larger and you get a tax receipt which reflects your larger contribution. The following chart summarizes the benefits of donating securities directly, rather than selling them and donating the profits. Planned giving is a form of stewardship for the future. It is a way of showing you care for the next generation. Making a planned gift can help maximize your tax and estate planning benefits. Your gift can be a one-time donation, a series of payment over a set period or ongoing support. Please consult your financial advisor should you be considering making a planned gift to MHI. In leaving a planned gift with MHI, you are ensuring that the tradition of compassion and caring is kept alive for future generations and you are reminding those in need that they have not been forgotten. If MHI is in your will or other estate plans and you have yet to inform us, please take a moment and let us know. Even if you wish for your bequest to remain anonymous, it's important to let us know so that we can ensure y our gift will be used exactly as you intend. It's a future gift that doesn't cost you anything during your lifetime. Bequests are revocable in that a subsequent will or codicil can cancel a bequest. Tax receipts for the full amount of your donation may offset capital gains or other taxes payable and lessen the financial burden to your loved ones. Bequests can be very simple and very flexible - just a paragraph in a will that is easy to insert. The information provided is not a substitute for professional financial or legal advice. Consult a lawyer and/or financial advisor to determine which options are best for you and your family, and to maximize the tax advantage of your gift. ​Celebrate and remember a loved one, friend or colleague who has passed by making a special gift in their memory. Your gift is a wonderful way to leave a legacy in their name. ​Make an occasion special by donating to MHI in honour of someone extraordinary. Perfect for any celebration, whether it be a birthday, anniversary, graduation, or bar/bat mitzvah. Multifaith Housing Initiative is a Canadian nonprofit charitable organization, CRA#85666 3083 RR0001.